Blending masculine and feminine: neither male nor female in appearance but having both conventional masculine and feminine traits and giving an impression of ambiguous sexual identity "androgynous looks"
A woman, whether gay or straight who likes to dress in way that is an equal blend of feminine and masculine. Clothes are not too baggy and are not necessarily too tight. A woman who would rather wear a pants suit than a dress. A man who has feminine characteristics/features but is yet still masculine. Which could also be the same as a metrosexual male. An example would be the above picture of the man to the left. 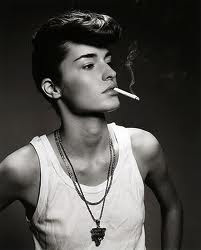 So tell me what is your take on androgynous dress in the work place? How bold can you be? It mainly depends on what kind of job you have. But If I had a corporate job where the dress code required me to wear business casual and/ or business professional I would still wear men's slacks and button down or whatever else I prefer. I would just have the clothes taliored to my body so it would look nice and neat or what have you so it wouldn't necessarily totally look like it is men's clothing. I wouldn't limit myself to what I wear.